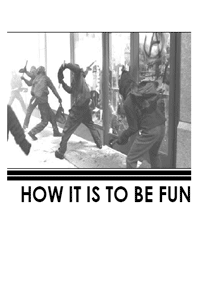 An easy-to-print and distribute one page zine introducing anarchist affinity groups and basic street tactics. It includes tips on how to form affinity groups, how to move within demonstrations, basic crowd navigation, security tips, and even suggestions for how affinity groups can be used outside of a demonstration context. 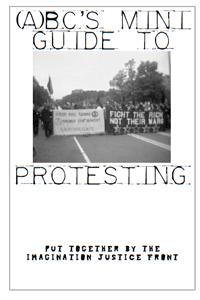 This is a mini-zine that functions as a pocket-sized guide to protesting. 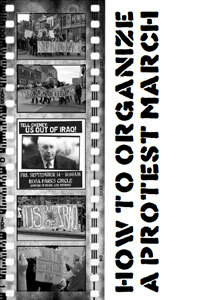 It provides basic information in an easy-to-distribute zine, covering topics such as what to bring (clothing, food, water, etc), what not to bring (drugs, alcohol, piercings, etc), what you will encounter at a larger protest (i.e. affinity groups and other concepts such as “diversity of tactics”), and more. There is also a list of websites for more detailed information on the topics covered. It’s the kind of zine that would be helpful to mass produce in a situation where there were going to be a lot of people newer to large-scale protests in attendance. 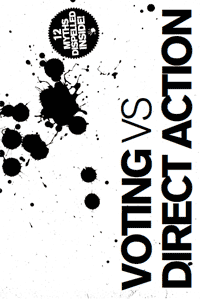 This short zine from Crimethinc provides arguments against voting and electoral politics in favor of direct action. 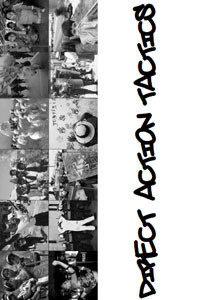 It also includes a section titled “12 Myths about Direct Action” that deals with common criticisms of direct action. Resistance in the Street is subtitled “A Guide to Keeping Safe & Free in Crowd Control Situations.” Known in some circles as an update to the classic “Fight the Man and Get Away Safely” zine, Resistance in the Street focuses on how to keep free from law enforcement while still keeping an offensive posture in the streets. It looks at how to dress, affinity groups, the importance of defense and knowing escape routes, basic police choreography, and the like. 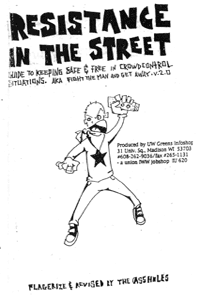 While some of the technology has no doubt changed since the early 2000s when this zine was written, much of its advice would still be helpful to those participating in a street conflict. This zine is a lengthy exploration of the various “crowd control” weapons that police and other security forces often use in protest situations. The zine includes not only tips for identifying which weapons have been used/are being used, but also outlines proper treatment protocols. There are also suggestions for purchasing gas masks and other protective gear. As always, the information contained within should be used for reference only and ideally accompanied with a street medic training. This zine is an introduction to anarchist street tactics, designed to be distributed to new anarchists. 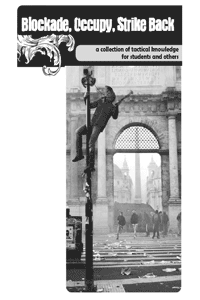 It was written in the context of the upsurge of interest in anarchism during Occupy Wall Street and covers what to expect at protests, how to form affinity groups, what to do at a protest, etc. It’s a good accompaniment to older zines on the topic such as Blocs, Black and Otherwise. 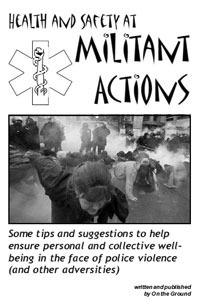 This zine was produced by an action medical collective called On The Ground. It’s goal is to empower—not frighten—people by giving them information about the potential risks and dangers of militant protest. It covers what to wear, staying safe and sensible in an action, what to do in case of injury, and chemical weapons aftercare. 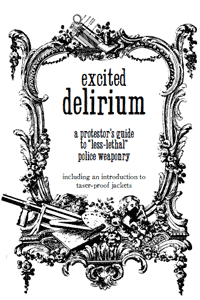 Billed as “a protestor’s guide to ‘less-lethal’ weaponry,” this zine is an incredibly thorough introduction to commonly used police weapons. 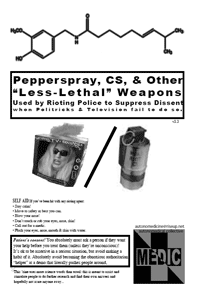 The zine provides a detailed look at all different types of weapons including electrical weapons (such as the TASER), chemical weapons (tear gas, pepper spray, and others), projectiles (pepper balls, rubber bullets, bean bags, flash-bang grenades). 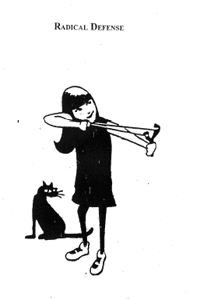 The zine ends with some suggestions on how to protect yourself from these weapons. 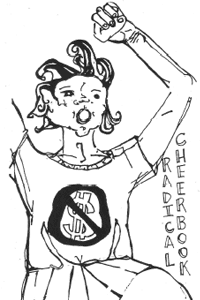 The original version of this zine comes out of the 2009/2010 university occupations in the United States. It was updated in 2012 to include lessons learned from Occupy Oakland. 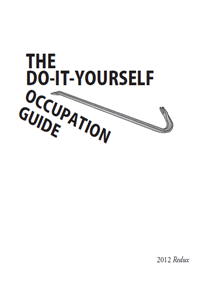 The zine provides an overview of techniques and tactics that can be used to occupy a building. Includes a look at various roles (media, legal support), reconnaissance, barricading, defending occupied spaces, and much more. 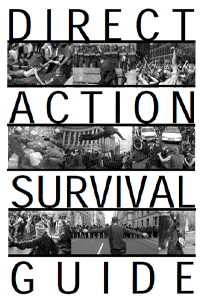 This zine offers a broad overview of direct action tactics. It begins by explaining the importance of affinity groups and moves into an overview of a broad range of direct action tactics including: pie-ing, squatting, culture jamming, jail solidarity, lock-downs and blockades, sabotage, street reclaiming, guerrilla gardening, and more. The zine is made of of selections from a book titled We Are Everywhere: The Irresistible Rise of Global Anti-capitalism that was edited by Notes from Nowhere. The original book chronicles the anti-capitalist/anti-globalization movement of the late-1990s and early-2000s. Consequently, a lot of the tactics discussed here come out of that context. A basic introduction to participating in a large-scale direct action protest (although the tips would likely be helpful for smaller scale actions too). Covers affinity groups, staying safe on the streets (crowd dynamics, police, using the buddy system, etc. ), basic medical information, chemical weapons (their use/effects and how to mitigate those effects), and jail and court solidarity. If you are going to read just one zine on direct action, this is arguably one of the most important. This is a comprehensive cartoon book explaining various tree protesting tactics (blockades, tree sits, sleeping dragons, etc). 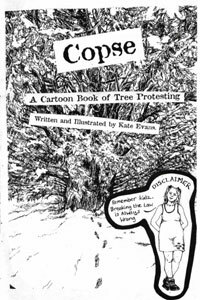 It came out of the anti-roads efforts in the UK and is a good primer for people interested in forest defense. 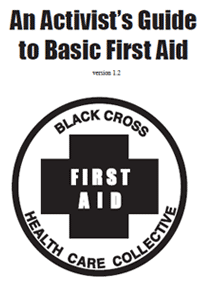 In this zine, the Black Cross Collective out of Portland provides a basic overview of first aid and health concerns as they relate to militant protests. 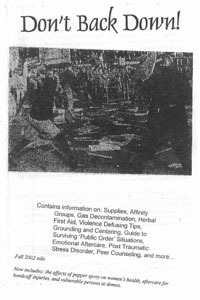 The zine includes a “protest fashion” section on what to wear and what not to wear to a protest, an overview of medical conditions you may encounter at a protest (and how to help folks), and dealing with pepper spray and tear gas. 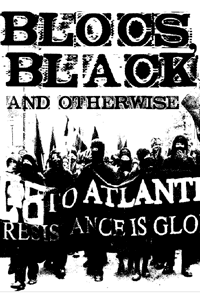 This zine provides an overview of how to participate in and organize a black bloc. It covers basic tactics and logistics from “what to wear” to “what to do.” The zine compiles two texts by Crimethinc: the original “Blocs, Black and Otherwise” from Recipes for Disaster: An Anarchist Cookbook along with a text titled “Fashion Tips for the Brave” that provides additional ideas and tips for anonymity in within a black bloc. This zine is designed to give readers a basic overview of how to do blockades. It covers human blockades, either by linking arms or using tools such as lockboxes and u-locks, as well as non-human blockades. If you are looking for anything beyond an overview of the basics of the tactic, it is recommended that you check out Basic Blockading. 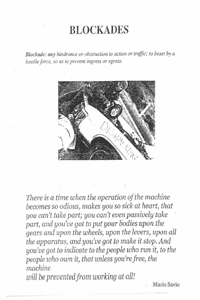 Blockade, Occupy, Strike Back is a zine version of a newspaper that was distributed by anarchists during the student strikes and social conflicts in Montreal during the winter and spring of 2012. 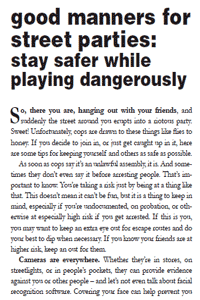 The zine is a good primer on street tactics with pieces on forming crews, occupying buildings, security awareness, and tips for participating in militant street protests. This is great for distributing to newer folks and useful for those who have been around a bit longer as well. 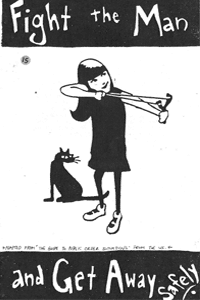 A very detailed zine that provides an excellent introduction to blockading. The zine covers everything from evaluating why you might want to utilize a blockade as a tactic to the nuts-and-bolts of blockading. It provides an overview of common tactics including lockboxes, tripods, u-locks, and more. 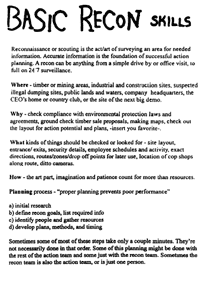 There is a helpful discussion of how to plan actions covering surveillance of the target, group communication, framing the action, safety considerations, etc. There are also thoughts on dealing with police, media, and employees. 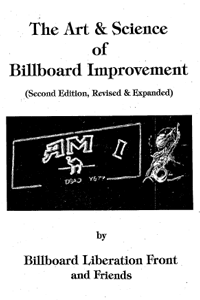 A classic pamphlet by the Billboard Liberation Front, this zine provides an introduction to modifying billboards to change their message (sometimes referred to as “culture jamming” or “subvertising”). It includes a very detailed section on how to do this ranging from ideas for design to discussion on how to climb billboards. 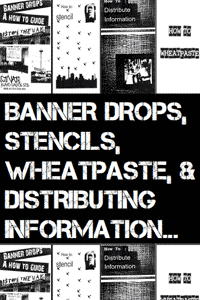 The zine also has a history of the Billboard Liberation Front. External resources: Activist Trauma Support’s Sustainable Activism and Avoiding Burnout flier. Street Acts have resources and ideas for street theatre, clowning and creative campaigning. Road Raging – a classic from the ’90s: the campaigner’s manual to fighting new roads, but most of this is applicable to any campaign. Well worth reading. 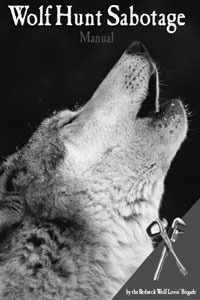 Campaign Against Cruelty – an animal activists’ handbook. All round manual – useful bits for all. Well worth reading. Delia Smith’s Basic Guide to Blockading Schnews DIY Guides – lots of useful How-Tos on all sort of things, from naughty to nice.